Discover a special panoramic location. This holiday home lies at an altitude of 810 metres, allowing you to enjoy a formidable view of the beauty of Umbria's nature and culture. 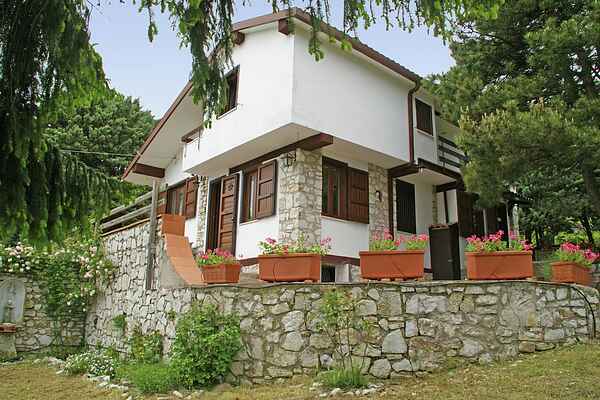 This house is the perfect home base for taking beautiful hikes through the forested area around Monte Subasio. Take a refreshing dive into your own private swimming pool. With the provided barbecue and pizza oven you have everything you need for a culinary evening on the terrace. Don't limit yourself to the house and its surroundings during your stay though. By car you can take a trip down the panoramic route through the area. Via the medieval village Collepino you drive over Monte Subasio to the hermitage \"Eremo delle Carceri di Assisi\". From here you can drive on to Assisi (18 km), the town of Saint Francis, with its basilica of the same name that consists of a upper and lower church in Gothic style. Follow the road in the direction of Spello (7 km). This characteristic town lies on a hill, which you enter through a beautiful Roman gate. From Spello you can drive through the hills to come home to your holiday home. Private swimmingpool. Dimension 9x4m. Deepth 1.20m x 1.90m.